Down to three skaters following two late penalties Lightning were battling to preserve a slender one goal lead against the six skaters of Flames who withdrew goalie Chris Carrozzi with a minute to go when the whole arena – bar the travelling supporters – erupted to not be just the extra man but the additional ten! Whether it was a clear message to the club owners about their passion for their little club or not it worked as the embattled heroes held on for a fantastic 4-3 victory. And the chanting didn’t stop at the final buzzer - it carried on for a good five minutes after throughout the post-match awards. It was a respite – brief as it may be – for the fans who had endured a turbulent few days following the announcement of Lightning’s departure from Elite level to the less expensive waters of the National Ice Hockey League. But Lightning’s poor form on the road continued on Saturday when they went 5-0 down at Sheffield Steelers before eventually losing 5-1. The Guildford victory won’t change anything in the league standings – the Surrey rivals all but having qualified for the play-offs and their former English Premier League colleagues still rooted to the bottom of the table 20 points behind the next best side, Dundee Stars. In a low key opening few minutes neither netminder had much to do as both sides failed to get more than the odd shot away before Michael Fine found the smallest of gaps at the left pipe to open the scoring on 11mins 1sec. But Lightning’s joy was short-lived because Guildford were level within 58 seconds –Evan Janssen had two attempts at beating goalie Patrick Killeen as he equalised from close range. MK edged ahead again on 21mins 34secs through Tim Wallace – but only after referees Matt Thompson and Stefan Hogarth consulted a video replay as there was a slight doubt that the puck had crossed the goal-line. If there were any questions about Wallace’s strike then there certainly weren’t when Andrea Valdix hit a rocket shot which thundered into the back of the net at 22mins 22secs. Flames took until the half way stage to step up their game – finally narrowing the gap when Ian Watters fired in to make it 3-2 on 37mins 36secs. Hopes of securing two points were raised when Wallace sent Nelson Armstrong away to fire in on goalie Chris Carrozzi – the attempt was blocked but the puck trickled over the line for a 4-2 score on 49mins 1sec. Once more Lightning soon conceded again when Foster was the provider for Jamie Crooks to narrow the deficit for Flames after 52mins 12secs. With a one goal lead to defend the tension built with five minutes to go and it reached fever pitch after Lightning were caught with too many men at 57mins 30secs and then David Norris was sin binned for hooking with 42secs to go. But with the MKL army behind them Wallace’s warriors marched home to victory. 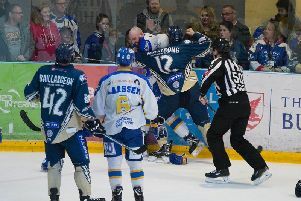 The next day a third period Georgs Golovkovs’ strike was all Lightning’s travelling army of noisy fans had to cheer about as the team visited the FlyDSA Arena in Sheffield for the final time on Saturday. Four goals in the latter half of the first period effectively saw Sheffield Steelers wrap up the win in the opening 20 minutes against a Lightning side icing six fewer players. In a clash notable for the total absence of penalties the home outfit opened the scoring on 10mins 26secs when Robert Dowd beat Killeen. Just over three minutes later, at 13mins 56secs, Sheffield doubled their advantage when Josh McFadden finished off. Worse was to come before the first intermission when Dowd hit his second and Sheffield’s third at 17mins 44secs before Steelers’ Brandon Whistle took the tally to four 57 seconds from the buzzer. To add to the misery Steelers made it 5-0 on 27mins 32secs through veteran captain Jonathan Phillips. It was not until the third session that Lightning fans had anything much to cheer about – Golovkovs breaking the side’s duck with a consolation goal on 44mins 35secs – Trevor Morbeck and Tim Wallace earning points for the helpers.